When he’s in a stressful situation, which is often, 15-year-old Christopher Boone sometimes recites numbers, rapid-fire, one after another. It’s understandable that Christopher would seek refuge in the solidity of digits and data. After all, he finds so many of the human beings in his orbit — emphatically including his parents — to be unpredictable, unreliable, even unfathomable. In SpeakEasy Stage Company’s “The Curious Incident of the Dog in the Night-time,’’ directed by Paul Daigneault, the challenge for Christopher (Eliott Purcell) is to wend his way through the thicket of familial secrets and lies he encounters after he sets out to solve the murder of a neighbor’s dog. 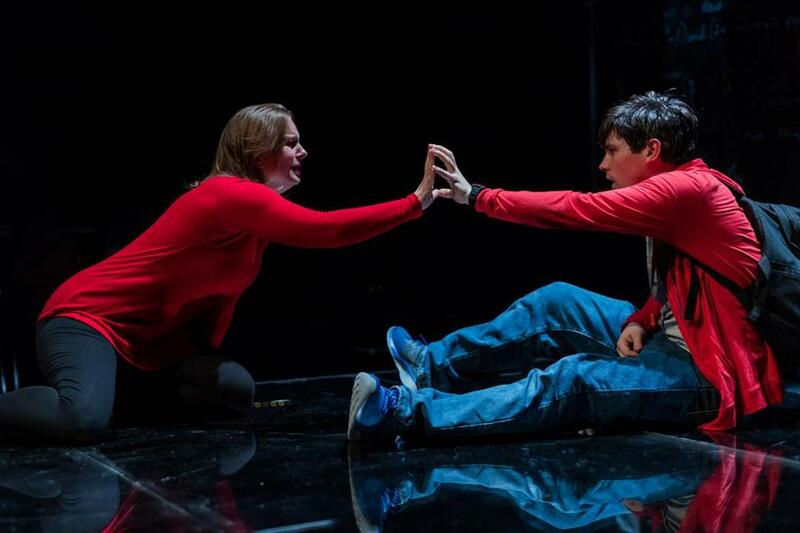 Given that a spectacular touring production of “Curious Incident’’ was at the Boston Opera House earlier this year, Daigneault faced his own considerable challenge. But SpeakEasy’s smaller-scale presentation more than stands on its own merits. Daigneault, the founder and producing artistic director of SpeakEasy, has reconfigured the Roberts Studio Theatre as a thrust stage. The audience is seated on three sides, lending a proximity to the performers that translates into an extra intensity of experience. Working in concert with movement director Yo-El Cassell and a top-notch design team, Daigneault employs a stage grammar that corresponds to the whirling intricacy of Christopher’s mind. Purcell admirably shoulders the role’s daunting, nonstop demands, both verbal and physical. While this may come as no surprise to anyone who saw this young actor at SpeakEasy in “Hand to God’’ as a Texas teenager possessed by a demonic sock puppet, it’s nonetheless extremely impressive. He is ably abetted in “Curious Incident’’ by a versatile and uniformly fine cast (though their British accents could use some work). They function not just as characters but also as a car, an ATM, a coat rack, and sundry other objects with which Christopher comes in contact. Both the stage and a high black wall upstage — the set design is by identical twins Christopher and Justin Swader — are covered with mathematical formulas. Illuminated blocks within the black wall periodically change color. Christopher is a math genius whose brilliance and behavior have led many to conclude he has Asperger’s syndrome, though it’s not spelled out in the adaptation by Simon Stephens of Mark Haddon’s best-selling novel. Christopher cannot stand to be touched; when he is, he responds with extreme agitation. Supremely self-confident on the surface, Christopher is riddled with anxiety — and he has plenty to be anxious about. As we see and hear, partly through readings of Christopher’s own writings by his teacher, Siobhan (Jackie Davis), his life in the town of Swindon, England, is unraveling as he prepares to take his A-level mathematics exam. His mother, portrayed by Laura Latreille, had vanished from his life two years earlier. After she disappeared without explanation one day, his father (Craig Mathers) told the boy that she died of a heart attack while in the hospital. Then Christopher discovers the dog’s bloody body, with a large gardening implement sticking out of it. When Christopher sets out to solve the crime, interviewing neighbors without quite meeting their eye, he soon learns that he has another, deeply personal riddle to decipher. Solving that puzzle requires Christopher to undertake a tumultuous journey to London. During that journey, sound designer David Remedios and lighting designer Jeff Adelberg adeptly conjure the sensory overload that is often how Christopher experiences the world. What we in the audience experience at this tightly constructed but moving production, meanwhile, is a reminder that when it comes to emotional weight in theater, scale doesn’t matter.